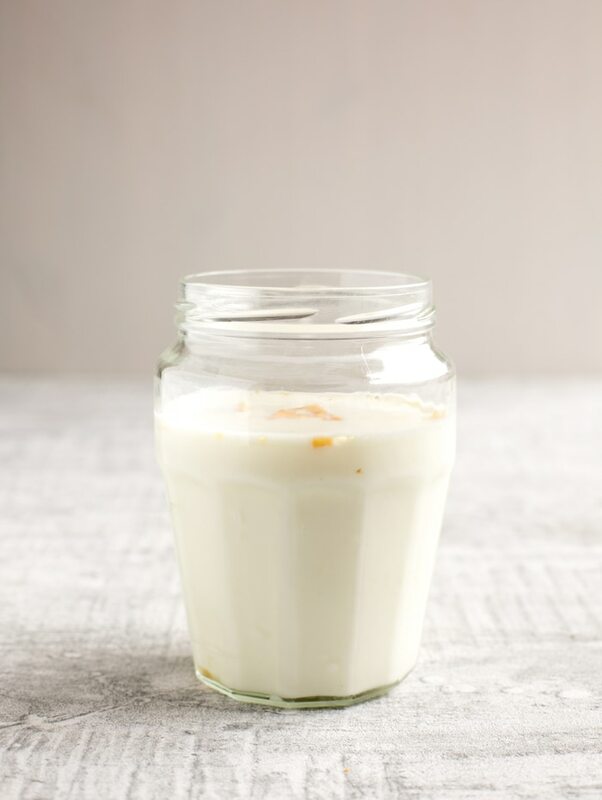 Homemade Milk Kefir is tangy as yogurt, thick and creamy as a smoothie and full of good-for-you probiotics. All the good reasons to learn how to make homemade kefir at home and skip the grocery store. Kefir is a super healthy food, said to have originated from the Turkish word “Keif” which means “good feeling”. It’s believed to have originated centuries ago from the shepherds of the Caucasus mountains. Kefir contains loads of probiotics (which aid healthy digestion) , even more than yogurt. It also contains some fantastic vitamins and minerals including calcium, magnesium, vitamin B12, folate, and enzymes. a) It’s healthier – Most commercial brands add sugar, flavourings. When making it at home, you know exactly what goes in, and keep it plain and simple. 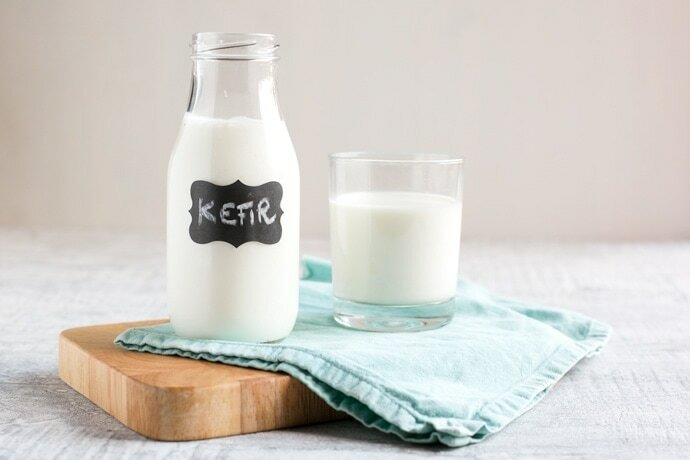 b) It’s cheaper – If you like to incorporate kefir in your daily routine, you’ll find that buying kefir grains, in the long run will be loads cheaper than store-bought kefir. Kefir Grains or Kefir Powdered Starter Culture? For first-time users, I recommend you use kefir powder instead of grains. Kefir grains are a bit more expansive (think of them as a small investment) and are live cultures, so you need to keep feeding them by making kefir over and over again, otherwise they will go to waste. Kefir powder, on the other hand is cheaper and intended for one-time-use (although you can technically make a few batches with 1 sachet)- Perfect if you want to try homemade kefir for the first time, or you’re making kefir only occasionally. What Milk Can You use? Whether you use kefir grains or powder, they work best with fresh whole animal milk. Opt for cow, sheep or goat milk. In my case, I choose all the way A2milk™. If you’ve followed this blog for some time, you know that I have a dairy intolerance. 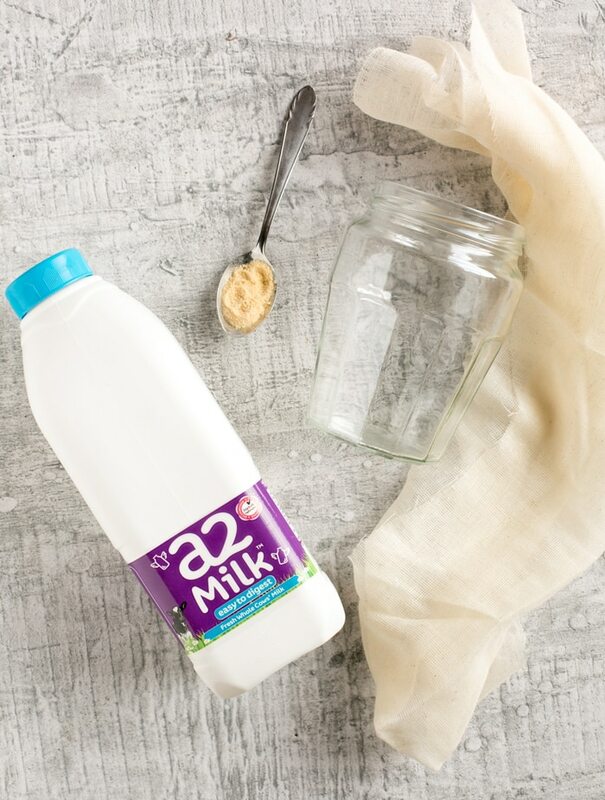 Luckily the award-winning brand A2milk, produces milk that is naturally free from the a1 milk protein, which is the one that causes many health issues to people who are dairy intolerant (think about cramps, bloating, acidity). 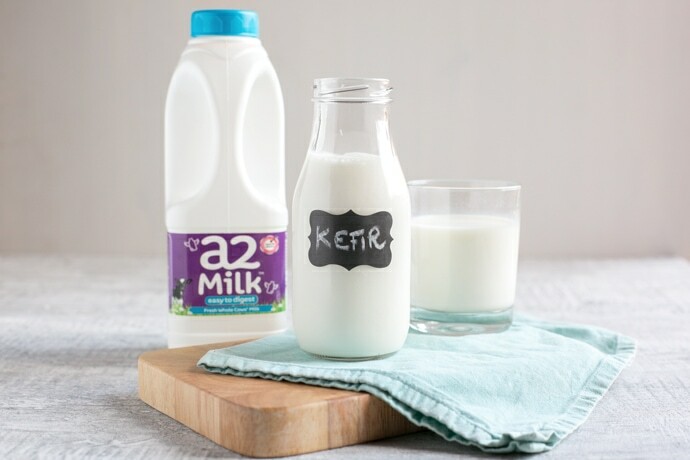 Since switching to A2milk I can safely said I didn’t have any of these symptoms, and I can happily make all sorts of dairy recipes (such as homemade butter, ricotta and yogurt), including this awesome homemade kefir. You don’t need any sort of special equipment to make homemade kefir. 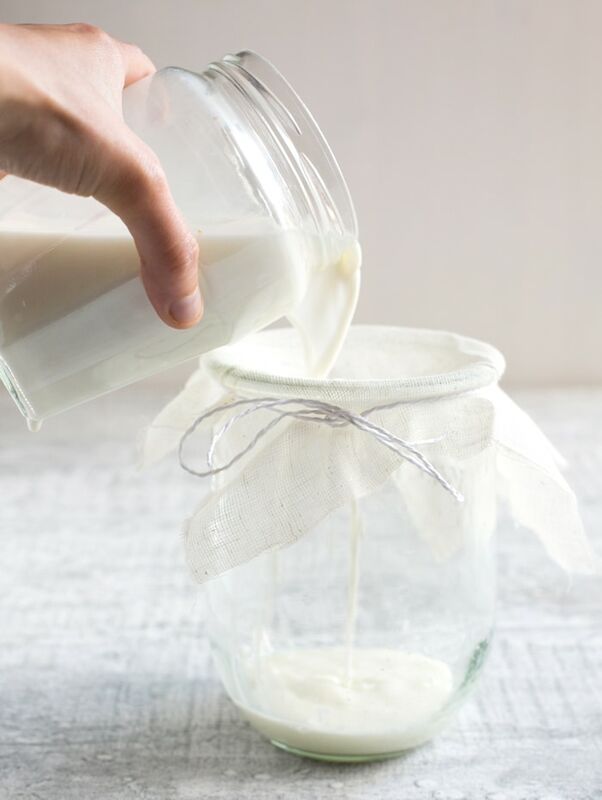 All you need is milk, kefir grains, a large mason jar and a small strainer or kitchen cloth. Start by placing the kefir grains or powder into the jar, then pour the milk in. 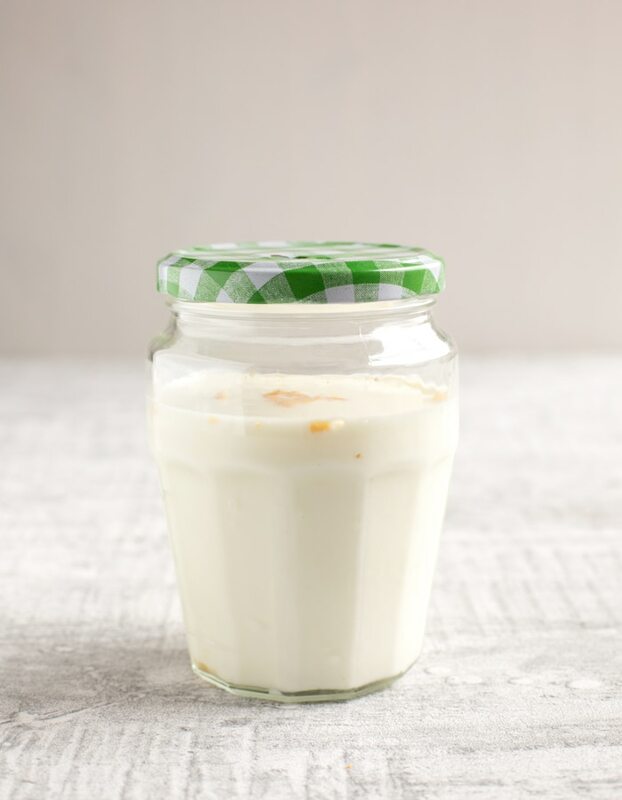 Cover the jar with the lid, but do not close it all the way, to allow the kefir to “breath”. Alternatively, cover the jar with a cheesecloth and secure with a band. Allow the kefir to sit at room temperature (ideally between 19-24 degrees) for about 24 hours. Once the 24 hours have passed, gently stir the kefir. It’s ok if it’s a little too thick, once strained it will reach a thinner consistency. Using a strainer or kitchen cloth*, strain the prepared mixture into another jar, to separate the grains from the ready-to-drink kefir. *If you’re using the milk kefir powder, you don’t necessarily need to strain, and the kefir is ready to drink immediately. Store in the fridge for up to 3 days. Drink kefir straight-up, or add it to smoothies, lassi or to smoothie bowls. You can also use it in place of yogurt/buttermilk/milk when baking cakes, muffins or pancakes. If you have used the grains, once strained, transfer them immediately in a new jar and repeat the whole process to make a new batch of kefir. Similarly, if you have used the powder and want to make a new batch of kefir, just save 60ml from the kefir you have just prepared and repeat the process. Where To Buy Kefir Grains or Kefir Powdered Starter Culture? The easiest way to get your hands on kefir grains is find a friend who already has a bunch of them. if you don’t know anyone, you can check on online local communities, or local Facebook groups. You can also buy kefir grains online, they’re easily available on Amazon. Kefir powdered starter cultures come in convenient sachets and are also available on Amazon. 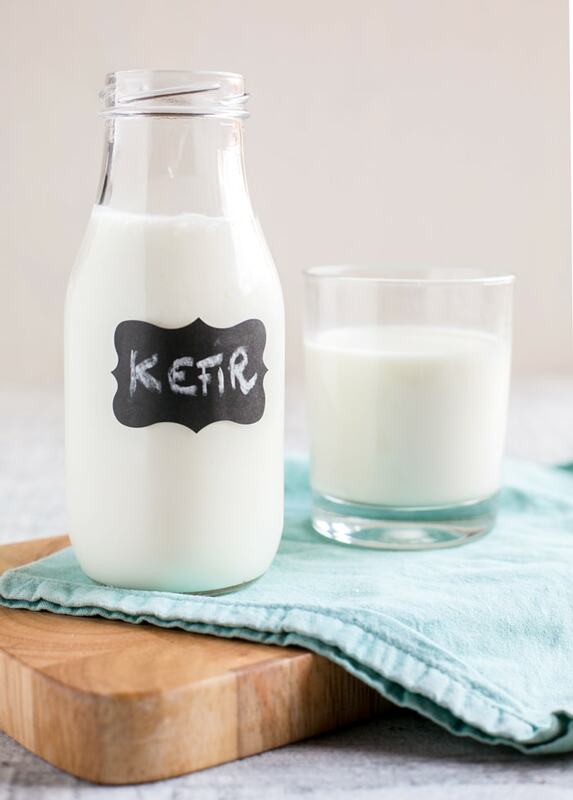 Homemade Milk Kefir is tangy as yogurt, thick and creamy as a smoothie and full of good-for-you probiotics. Drink kefir straight-up, added to smoothies, or use it in place of yogurt/buttermilk/milk when baking cakes, muffins or pancakes. Once the 24 hours have passed, gently stir the kefir. It's ok if it's a little too thick, once strained it will reach a thinner consistency. Using a strainer or kitchen cloth*, strain the prepared mixture into another jar, to separate the grains from the ready-to-drink kefir. I have never heard of this or tried it. But it does look like something I really should try as it sounds so good for you. Simple I may have to try it out! I’ve just started making my own water kefir, which isn’t very tasty although I’m getting used to the taste! I’m a bit over run with grains though, I didn’t realise they multiplied! It’s a learning curve, I’m really enjoying it! This sounds fascinating to make, and tasty to drink too!